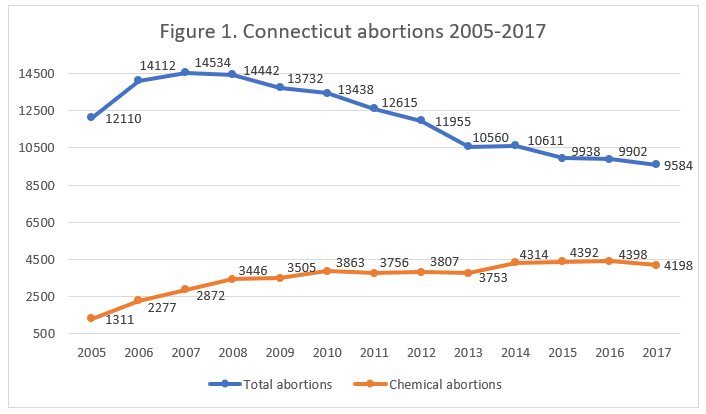 Connecticut’s annual abortion report for 2017 shows that abortions in the state have continued their downward trend. The report was provided to the Charlotte Lozier Institute by the Connecticut Department of Public Health upon request. *Information on Connecticut’s state abortion rate and Planned Parenthood’s Connecticut market share is not publicly available. In 2017, there were 9,584 abortions reported in Connecticut (Fig. 1). This was a drop of three percent from 9,902 abortions in 2016 and a decline of 28 percent from 13,265 abortions in 2001. Forty-four percent of the abortions reported in 2017 were chemical abortions. Chemical abortions fell by five percent from 4,398 in 2016 to 4,198 in 2017, but increased by 803 percent from 2002, the first year chemical abortions were reported as a separate category. 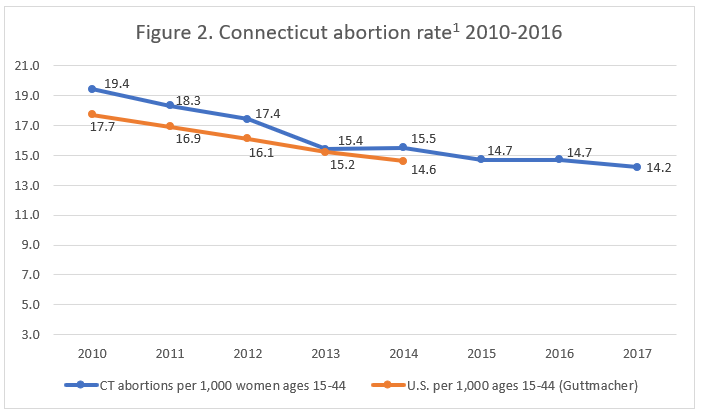 Connecticut does not report the state abortion rate, but the Charlotte Lozier Institute estimates that the rate in 2017 was 14.2 abortions per 1,000 women of childbearing age (Fig. 2). The vast majority of abortions reported in Connecticut (97 percent) were performed on residents. Two percent of the abortions were performed on women from Rhode Island, New York, or Massachusetts, and less than one percent on women from other states. More than half the abortions (56 percent) were performed on women in their twenties and 29 percent on women in their thirties. Nine percent of the abortions reported in Connecticut were performed on women under the age of 20 and four percent on women age 40 or older. Two percent of the abortions were performed on women of unknown ages. Eighty-eight percent of the abortions performed in Connecticut occurred at 12 weeks of gestation or earlier. Five percent were performed between 13 and 15 weeks, and three percent were performed between 16 and 20 weeks. Eighty-nine abortions, almost one percent of the state total, were performed at 21 weeks of gestation or later, when babies can feel pain. However, gestational age was unknown for two percent of the abortions, and therefore the true number of abortions performed later in pregnancy may be higher. Almost half the abortions reported in Connecticut, 49 percent, were performed using suction curettage, while 44 percent were medical, non-surgical procedures. Seven percent of the abortions were performed via dilation and evacuation, and 0.2 percent (15 abortions) were performed using sharp curettage. The majority of abortions, 94 percent, were performed in free-standing clinics. Five percent were performed as hospital outpatient procedures and 0.2 percent as inpatient procedures. Not quite one percent were performed at doctor’s offices or other facilities. In 2017, there were 294 girls under 18 years of age who underwent abortions in Connecticut. Currently, Connecticut has no parental consent requirements before a minor may obtain an abortion. The state legislature is now considering a bill that would require that a parent or legal guardian be notified before an abortion could be performed on a minor under the age of 18. According to a report from the Connecticut Catholic Conference (CTCC), most out-of-state minors who travel to Connecticut for abortions come from states with parental consent laws. In 2017, there were 20 minor girls from other states who visited Connecticut for abortions. The CTCC points out that Connecticut’s lack of a parental notification requirement puts both its own minors and minors from other states at risk. In a 2016 CLI study of abortion reporting across the 50 states, New York City, and the District of Columbia, Connecticut’s reporting was ranked at 41st place. Currently, Connecticut collects but does not report basic demographic data, including women’s race, marital status, level of education, and previous pregnancies. Connecticut also records whether any complications resulted from abortions. Connecticut could improve its reporting by incorporating more of the information it collects into the annual abortion reports. Additionally, Connecticut could make its annual reports more accessible by publishing them on the health department website. Connecticut does not report the state abortion rate. Rates were calculated by the Charlotte Lozier Institute using population estimates from the United States Census Bureau. The rates were calculated using the following formula: (total number of abortions performed in Connecticut ÷ number of resident women ages 15-44) x 1,000.